Urban Archeologist: I Love Quackery: Baldness Kills! THE URBAN ARCHEOLOGIST OFFICIAL WEB SITE!! 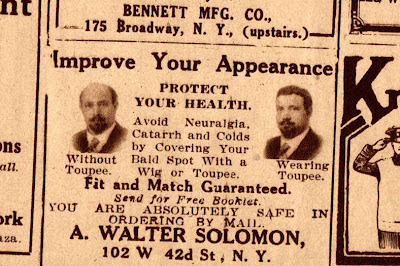 I Love Quackery: Baldness Kills! Ok, so it doesn't exactly say "Baldness kills!" What I really like about the ad is the ultra obvious "before and after." Oh, so that's what wearing a toupee looks like. Please explain to me why ordering by mail wouldn't be safe? Some rash of rug snatching highwaymen? 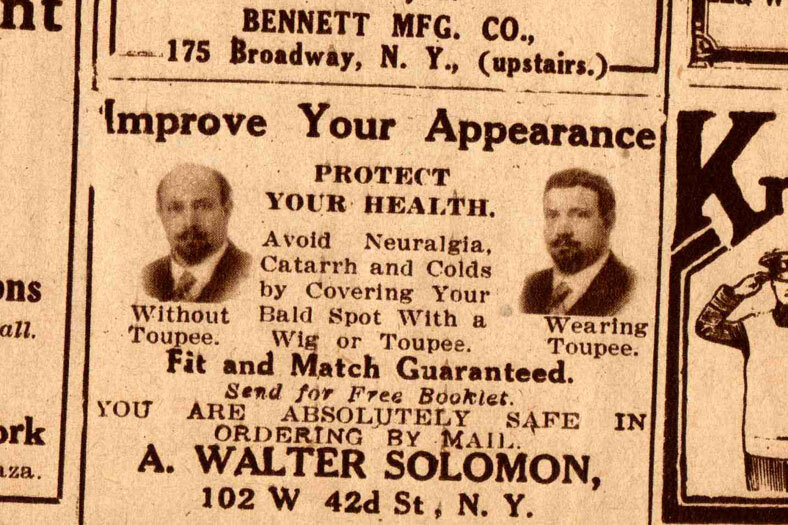 Another gem from a 1917 New York Times. Found something unique? See something here you want to know more about? Start the discussion - I'll respond. Really! I have created a display for those hidden treasures- that are no hidden. Join my email list and see my new discoveries first! Candy's dandy but is it for breakfast?